Gregory Cerio recently became editor of The Magazine ANTIQUES, the sixth since the publication’s founding in 1922. A career magazine journalist, he has a deep and abiding interest in the fine and decorative arts, design, and architecture. He was the founding editor of Modern Magazine in 2009; and a senior features editor for House & Garden magazine from 1998 to 2007. Gregory has a degree in English literature from Washington College in Chestertown, Maryland, and grew up in the city of Annapolis. He has lived in Dublin, Ireland, and Barcelona, Spain. 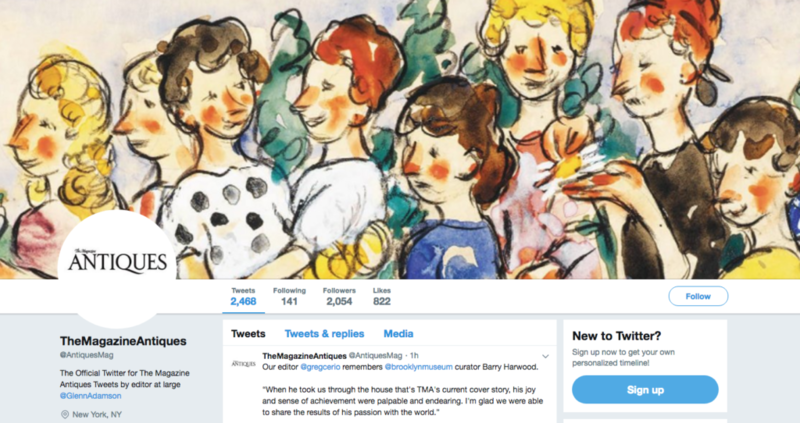 "Our magazine serves as both a guide and an intelligent companion to a particularly thoughtful and discerning readership made up of collectors, scholars, lovers of history, and aficionados of the arts. 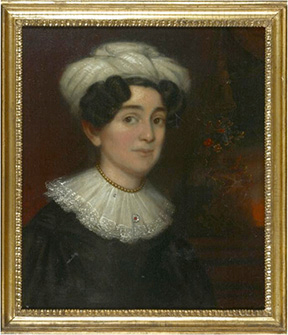 They travel, visit museums, and while away hours in antiques shops and galleries. 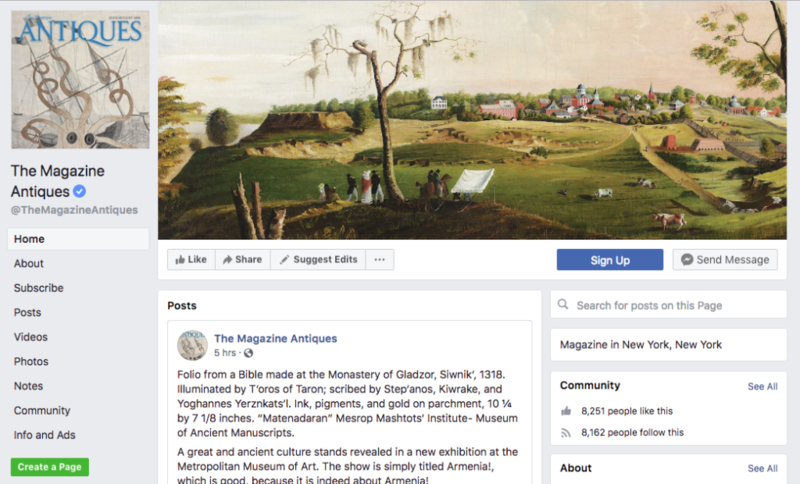 They live their passions and know they can count on The Magazine ANTIQUES as an authoritative resource, pointing the way toward new discoveries." After 15 years as an American art dealer and gallery director, Don Sparacin joined The Magazine ANTIQUES in September of 2011. Don brings a vast breadth of knowledge of the American paintings market to the publication—an important niche within the magazine’s editorial and advertising content. As a former gallery director responsible for managing significant advertising budgets and schedules, he understands the needs of the advertiser from an inside perspective. In 2015, with 4 years of sales experience at the magazine, Don was named publisher. His goal is to help maintain the legacy of the century-old brand and provide an important forum for dealers, museums and luxury brands to promote their businesses. He looks forward to building strong relationships with advertisers as well as with our print and digital audiences. “As one of the pillars of the market, our magazine provides the scholarly context necessary to give value to the objects we cherish. 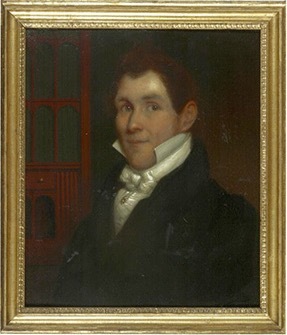 This trait is unique amongst the few publications serving the antiques community." Our loyal readership of 80,000+ considers the magazine an intelligent, critical publication. Our readers are smart, cultured and have a strong interest in the arts. *Source: Simmons Subscriber Study. Art in America Reader Survey, 2011. **Publishers Statement of Ownership and Circulation, 2014. No changes or cancellations will be accepted after closing date. Please provide a click-through URL for all ads. All ads should be 72 DPI and in RGB color. Ads with a white background must have at least a .25pt border. *3rd party impression tracking pixels are not accepted for newsletters. We do accept URLs built with a tracking UTM. **Dedicated E-blast: 600 pixels max width; JPG or GIF images should be hosted on advertiser website; no rich media, attachments, scripts or automatic downloads. All style/CSS must be embedded within the HTML. External CSS not accepted. ***The Magazine ANTIQUES welcomes the opportunity to place special/non-standard formats, but they must be cleared for compatibility. Curious Objects, hosted by Ben Miller. Our podcast Curious Objects is available in both streaming and downloadable formats. The Magazine ANTIQUES growing digital community is engaged 24/7 beyond the pages of the magazine. Our readers stay connected to the art world and drive the conversation. 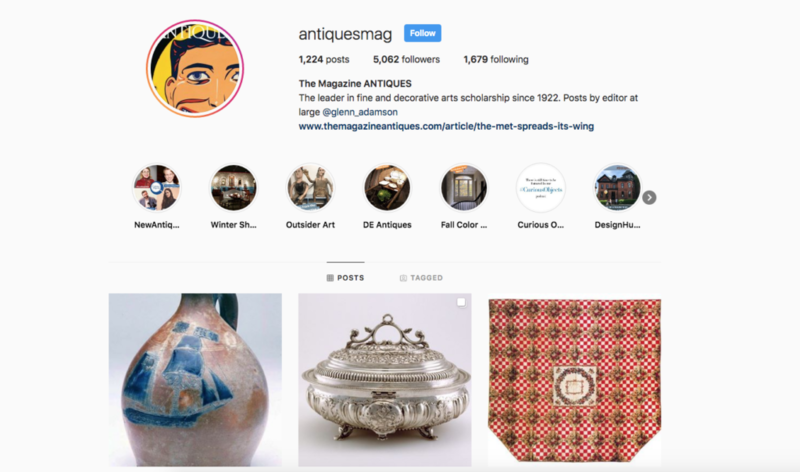 The Magazine ANTIQUES offers opportunities for creative partnerships across all of our social and media platforms. "Nathan Liverant and Son is a proud supporter of The Magazine ANTIQUES and has advertised there regularly since the 1960s. 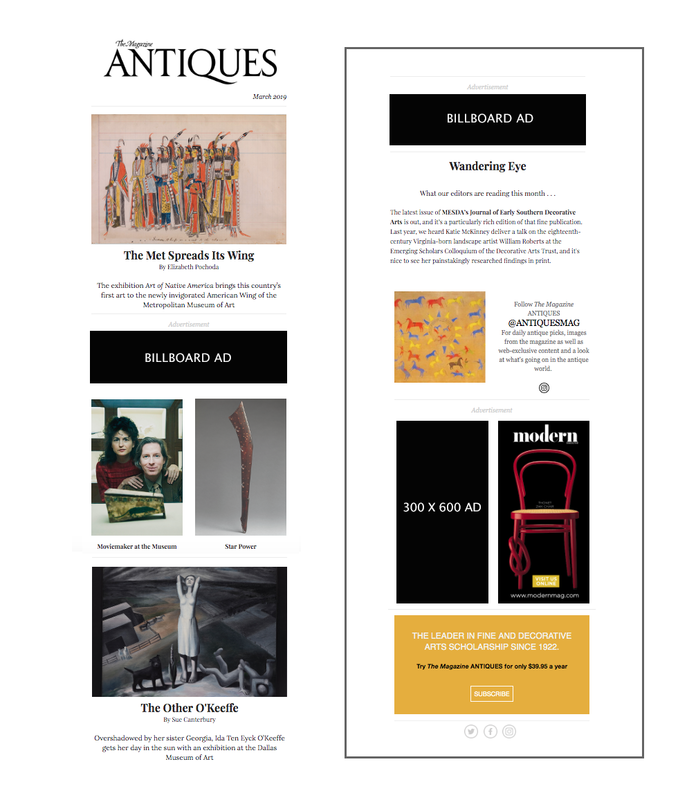 We continue to regard the magazine as the backbone of the antiques industry. The Magazine ANTIQUES is synonymous with the highest editorial policy and well-documented articles. It is the publication that most students of the decorative arts follow for new developments and the latest research. It is always exciting to view the creative and artistic marketing by the advertisers and our colleagues. The Magazine ANTIQUES has given our business national exposure to collectors, museums, and those interested in American decorative arts. The magazine has given us the opportunity to direct our advertising dollar to a concentrated audience, and has helped us develop our national reputation. 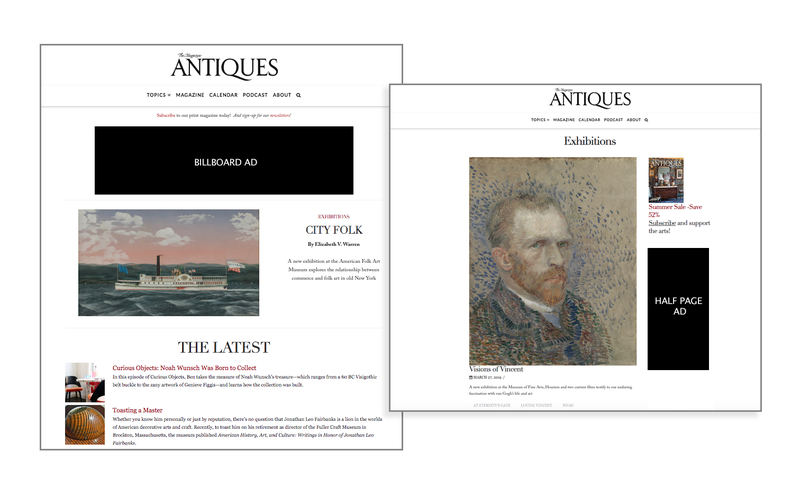 We highly recommend The Magazine ANTIQUES as the premier advertising vehicle to reach an engaged group of subscribers interested in American antiques, art and the antiques industry." "In my experience, advertising dollars invested with The Magazine ANTIQUES is money well spent. My responses to ads have always been vigorous and diverse, often resulting in strong sales. I appreciate the professional service provided by the sales and production teams. In an ever-increasingly competitive market, it is crucial to focus one’s energy and resources in a highly focused way. The Magazine ANTIQUES provides that focus for me through its readership. The calls I receive from advertisements in The Magazine ANTIQUES invariably come from serious, sophisticated collectors. It is very common for me to hear from collectors months later that they admired my ad in a previous issue." "Just a short note to thank you again… You may perhaps decisively refer to me as a nostalgia-buff or a rank sentimentalist…but I prefer to view myself as a new-age kind of guy—“everything old is new again”. It occurred to me that perhaps that’s why I advertise in The Magazine ANTIQUES. It stays true to itself and its mission, and, in an age of instant-hype, overkill and art-media intent on covering fads and flavors-of-the-month, The Magazine ANTIQUES continues to stand alone, presenting a scholarly approach in its beautiful, glossy pages. It’s called an old-fashioned approach and I guess I’m an old-fashioned kind of guy. So be assured that as long as I can afford to, I will stay loyal and support your wonderful publication." Bernard & S. Dean Levy, Inc.
Debra Force Fine Art, Inc.
Gary R. Sullivan Antiques Inc.
William Vareika Fine Arts Ltd.
Jeffrey S. Evans & Assoc. All measurements provided W" X H"
Publication trim size: 8.5" x 10.875"
Live Area: 7.125" x 4.625"
Furnished material will be destroyed after 6 months unless written instructions to the contrary are received within one month of publication. Advertisers will be presumed to have read the requirements to the right and agreed to its conditions without further notice. The Magazine ANTIQUES reserves the right to charge advertisers that require the composition of an advertisement, alterations to supplied final materials, and/or the creation of proofs. • When supplying non-ﬁnalized materials: Photographs must have a sharp focus, high contrast. Copy should be clearly submitted and be proofread in advance. Art ﬁles must be created in either Photoshop or Illustrator and saved as an EPS, JPEG, or TIFF. • Materials not meeting these speciﬁcations will incur production charges that will be billed at commercial rates. • Proofs: The only acceptable SWOP proofs are a Kodak, Epson, Fuji, or Matchprint. TMA can provide a color proof of your advertisement for an additional fee of $80 per page. A SWOP proof pulled by TMA will be sent directly to press for color guidance. A SWOP proof pulled by TMA will only be shown to client upon request, provided that the ad was submitted on or before the published advertising material due deadline. TMA is not responsible for reproduction if the client is not able to sign off on the proof. TMA is not responsible for variance between the digital ﬁle and any proof not listed above. • If the above requirements are not met, TMA cannot guarantee reproduction of the advisement. All claims for errors in advertising must be submitted in writing within seven days of publication. • Material will be destroyed after 6 months unless written instructions to the contrary are received within one month of publication. Advertisers will be presumed to have read the requirements and guidelines on this page when submitting creative and agree to its conditions without further notice. Client represents that it is the owner of and/or has the right to use and publish the advertising (including but not limited to artwork, ideas, expression, copyrights, rights of publicity and trademark submitted by it for publication in The Magazine ANTIQUES and that the advertising contains nothing that violates the rights of the third party. In the event such advertising results in a claim or suit against The Magazine ANTIQUES. Client agrees to assume full responsibility for such claim or suit and hold harmless and indemnify The Magazine ANTIQUES, against all claims, demands, suits settlements, judgments, awards, damages and/or expenses (including attorney’s fees) arising out of any claim or lawsuit. A. Verbal agreements are not recognized. B. Publisher is not liable for delays in delivery and/or non-delivery in the event of act of God, action by any governmental or quasi-governmental entity, fire, flood, insurrection, riot, explosion, embargo, strikes whether legal or illegal, labor or material shortage, transportation interruption of any kind, work slowdown, or any condition beyond the control of publisher affecting production or delivery in any manner. C. Orders are accepted subject to change in rates upon notice by publisher. D. The publisher reserves the right to reject or cancel any advertising, which in the opinion of publisher does not conform to the standards of the publication. E. When change of copy for advertising under contract is not received by closing date, the advertisement in the previous issue will be inserted. F. The word "Advertisement" will be placed with copy that in The Magazine ANTIQUES' opinion resembles editorial matter. G. Contracts must be completed within one year from date of first insertion; otherwise charges will be adjusted in accordance with the rate applicable to the number of insertions actually used. H. The Magazine ANTIQUES' liability for any error shall not exceed the cost of the space occupied by error. I. The Magazine ANTIQUES assumes no liability for errors in index to advertisers or complimentary geographical listings. The publisher assumes no liability if for any reason it becomes necessary to omit an advertisement. J. Whereas The Magazine ANTIQUES exercises care in screening images and text submitted by its advertisers, it does not guarantee the authenticity of objects or quality of services advertised in its pages, nor does it accept any liability which may arise from the purchase or sale of objects or services advertised. See "Contract and Copy Regulations" in Consumer Magazine edition of Standard Rate and Data Service, number 2, 10, 13, 24, 31, 32, 35, 41, and 42.